Thank you to the Edelman household! We would like to thank the Edelman’s for choosing us to help them join the solar movement! Now they are saving money on their electric, and greatly lessening their carbon footprint! We sure hope the sun is shining on them! We would like to thank the Ciosek’s for going solar! Now they are educated and equipped in solar! That is, with a state of the art system producing 9.6 kW. The array looks fantastic on top of their roof! Keep shining on, guys! Net metering allows residential and commercial customers who generate their own electricity from solar power to feed electricity they do not use back into the grid. 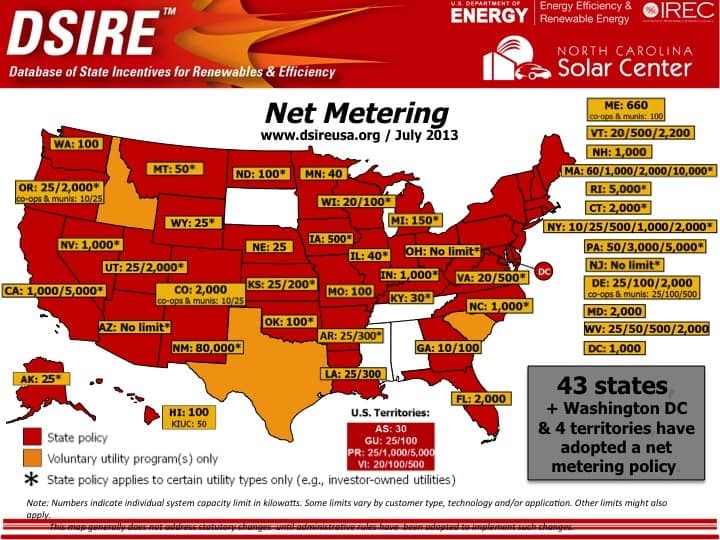 Many states have passed net metering laws. In other states, utilities may offer net metering programs voluntarily or as a result of regulatory decisions. Differences between states’ legislation and implementation mean that the benefits of net metering can vary widely for solar customers in different areas of the country. Net metering is a billing mechanism that credits solar energy system owners for the electricity they add to the grid. For example, if a residential customer has a PV system on the home’s rooftop, it may generate more electricity than the home uses during daylight hours. If the home is net-metered, the electricity meter will run backwards to provide a credit against what electricity is consumed at night or other periods where the home’s electricity use exceeds the system’s output. Customers are only billed for their “net” energy use. On average, only 20-40% of a solar energy system’s output ever goes into the grid. Exported solar electricity serves nearby customers’ loads. This digital meter runs in both directions to accommodate electricity generated at this customer’s home. of electricity each calendar year, saving the homeowner over $380 on their utility bill. Net metering allows utility customers to generate their own electricity cleanly and efficiently. During the day, most solar customers produce more electricity than they consume; net metering allows them to export that power to the grid and reduce their future electric bills. California public agencies and schools will save $2.5 billion in electricity costs over the next 30 years using net metering. Net metering provides substantial statewide economic benefits in terms of jobs, income and investment. Net metering increases demand for solar energy systems, which in turn creates jobs for the installers, electricians, and manufacturers who work in the solar supply chain. Today, the solar industry employs nearly 174,000 American workers in large part due to strong state net metering policies which have allowed the solar industry to thrive. Advocate for solar energy. Your voice counts! SEIA Advocacy.